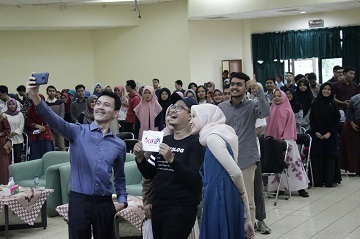 In order to continuously improve the quality of graduates of IPB University, the Directorate of Student Affairs and Career Development conducted a training entitled "Career Path and Self Selling", Sunday (7/4) at the Dramaga Campus of IPB, Bogor. This activity presented two speakers namely Andrixinata Bahran and Fike Kirein. Both are Certified Personal and Interpersonal Coach and Certified Professional Youth Couch. On that occasion, the Head of Sub Directorate of Career and Entrepreneurship Development, Handian Purwawangsa, S.Hut, M.Sc, reminded the participants of the importance of preparing the post-campus world well. "I want to remind the students who are here, that the education that you live in during college is important. Similarly, education at the end of the study period. All of you must be able to package the skills of skill with soft skills and an attractive appearance so that the knowledge you learn during your study in IPB can be applied well in the post-campus world," said Handian Purwawangsa. Andrixinata Bahran, who is also alumni of batch 44 of IPB, delivered material about job interviews and the Myers-Birggs Type Indicator (MBTI) test. "When you are in the job interview process, you have about 30 to 60 seconds to be able to introduce yourself as best you can. At that time, we can do personal branding as much as possible to convince the company to accept us as employees. In addition, there is also an MBTI test that is also commonly used by companies. This MBTI test is commonly used by companies because the results tend to be consistent even if done repeatedly. Therefore, today I want to make you try this MBTI test," explained Andrixinata.